Young is director of school nutrition for Rockingham County Schools. She works with the schools in her district to provide healthy food to all students while keeping cafeterias from overspending their budgets. But recently, school districts in North Carolina and across the country have been facing thousands of dollars in debt from school lunch programs. While the schools are trying to manage what they spend on food, labor, and supplies, many cafeterias end up providing meals for students who don’t pay. Often these students are eligible for the federal free and reduced lunch program, but their parents haven’t applied for the benefit. In other cases, parents forget to send lunch money or add funds to their child’s school lunch account. When a child doesn’t have lunch money, some schools swap a hot meal for a cheese sandwich or only provide fruits and vegetables. Other cafeterias won’t serve the child at all to avoid the unpaid meal. Doing so leaves a child without a nutritious lunch, sending them back to a classroom on an empty stomach – without fuel to learn. But for schools like Young’s that have a commitment to serving children healthy, warm meals, the unpaid lunches can add up. When kids don’t get their lunches at school, they have trouble focusing in class and their performance suffers. According to No Kid Hungry, when students don’t get enough to eat, 80% of teachers see them lose the ability to concentrate, and 62% see behavioral and discipline problems. School meals have a powerful effect on kids’ health, behavior and academic performance – a hungry kid just can’t learn. In most cases, a school’s meal budget is separate from other budgets used for salaries and supplies. At Young’s schools, when the lunch debt needs to be paid, that money comes from the school’s general fund. Money that would otherwise go toward things like educational games and science equipment ends up being used to cover the debt. “Schools really depend on these general funds to purchase educational items that enrich classrooms, but if we use that money to pay for lunches, our teachers have to rely on community donations or fundraisers,” Young said. To help address the school lunch debt in North Carolina, Blue Cross NC announced in May a commitment to pay the debt in five Piedmont counties. 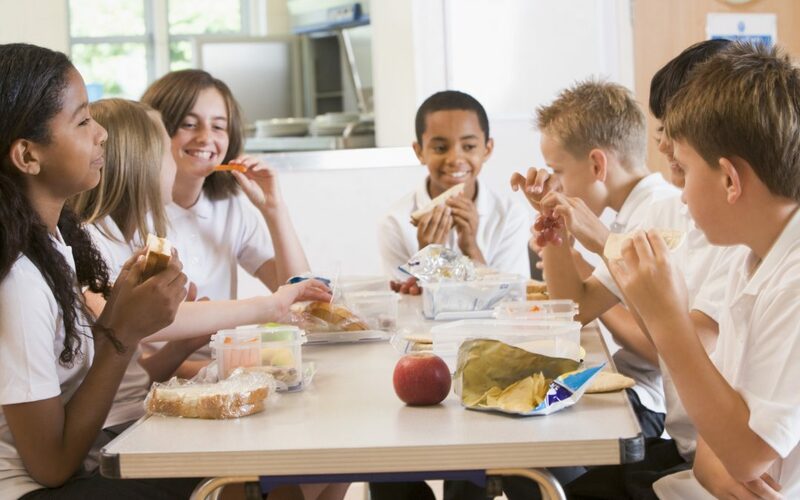 Nearly $160,000 will go to Alamance, Guilford, Forsyth, Davidson, and Rockingham counties to eliminate lunch debts and help schools provide for kids who lack access to affordable healthy food.